Hi, I just shared a project for Valentine's Day. Mine was made with both a cnc router and a 3D printer. 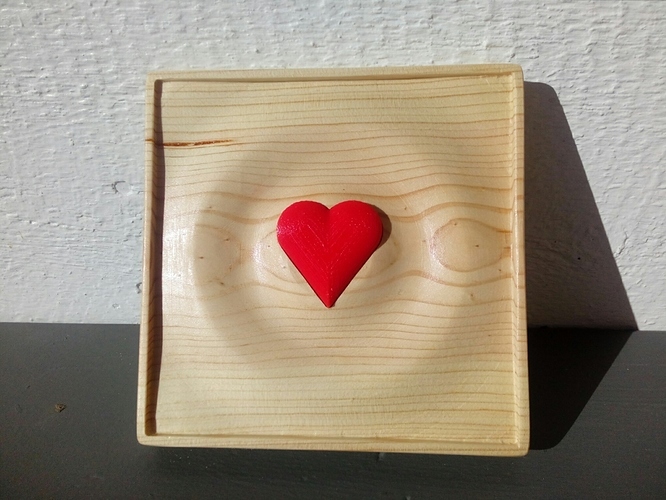 However, I am including an extra SVG of the heart "inlay" so you could just cut it out of a complimentary piece of wood. Enjoy! I knew I didn't want the image to go "all the way through" the wood, so I set the grayest gray of the SVG to 50% using the setting of 127 (this sets the shade to 127,127,127). I set the lightest shade of gray to almost white or about 250. This created the stepped grayscale SVG that I uploaded with the project.